Can’t believe I’m saying this, but Power Plates makes its way into the world today! It’s been a long time coming, but over two years, 100 recipes and photos, and many sinks full of dirty dishes later, it’s here. You can read more about the book here or in this weekend reading post from the fall. 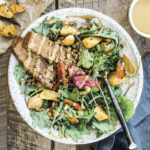 It’s a collection of 100 vegan meals that provide plant-based protein, healthful fat, and energizing complex carbohydrates. Nothing overly prescriptive, and it’s certainly not a diet, nutrition, or fitness book. The idea was simply to offer up vegan recipes that contain a solid balance of macronutrients (more of my thoughts on that topic in this post), along with flavor and staying power. The book doesn’t have any appetizers, small plates, snacks, or desserts (though I wish I’d had some desserts to test!). All of the recipes are meant to be enjoyed as meals. I give readers the invitation to enhance them or pair them with other things according to appetite, which means that they could be stand-alone dishes, but there’s lots of room to customize them and make them work for your body and life. Today, in order to celebrate the book, I’m sharing one of my favorite recipes from its “bowls” section (it’s got six recipe chapters: breakfasts, salads, soups, bowls, stovetop meals, and bakes). 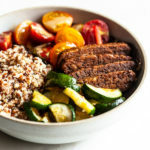 These harvest bowls are full of sweet and savory flavors, packed with tender roasted root veggies, chewy spelt berries, and a cider-baked tempeh that I think is pretty irresistable. The maple mustard dressing was a favorite with my recipe testers, and it can be made as a vinaigrette or with tahini for an oil-free option. I cooked it last fall, when the weather was just getting cool and root vegetables were piling into the farmers’ market, and it’s one of the recipes I’ve revisited most often since. Preheat the oven to 400°F (200°C), oil a 9-inch (23-cm) square baking pan, and line a rimmed baking sheet with parchment paper. Cook the spelt berries or other grain according to package instructions (the grain can be cooked a few days in advance). *Substitute brown rice, millet, or quinoa for a gluten free option. All of the bowl meals in the book benefit from a little advance prep, and this one is a good example. You can cook your grain in advance, make the dressing ahead of time, and/or roast the root vegetables or tempeh a few days before serving. The components shine when they’re together, but they’re useful sides on their own, too (I’ve made the tempeh a bunch of times without serving it in the bowls). If you’re curious about the book, I’m offering US and Canadian readers a chance to win it today! I’ll be picking three winners from the Rafflecopter drawing below, and I’ll announce them next Wednesday (1/31). Good luck to those who enter, and a big and heartfelt thank you to everyone who takes the time to check in and read this blog from week to week. 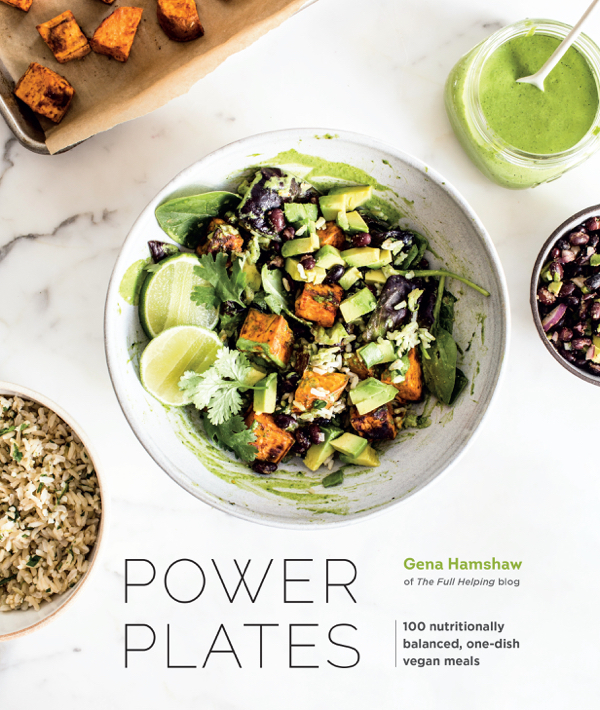 Power Plates grew out of the love I have for creating and sharing food within this space, and the book is dedicated—from the bottom of my heart—to you. I love a good one pot lentil soup 🙂 This book looks amazing! Hard to beat beans and greens! So excited for the release of Power Plates! I just read an awesome review of Gena’s latest masterpiece in an email/blog post from the Vegan MOS at https://veganmos.com/power-plates/. This will be the next vegan cookbook to assist me in my vegan cooking journey! Congrats Jena! And the giveaway opportunity. I love making roasted veggie bowls in the winter and would love to win a copy of your book to expand my go-to recipes for nourishing meals! I love one dish meals and bowls that have a variety of tastes and textures. Can’t wait to get your book! My favorite always ends up being a hug random bowl of greens, a grain, protein and veggies. I love your blog, and I love your recipes! I usually make nutrient dense salads as my one dish meals. Delish! This book looks fantastic! I can’t wait to check it out. I love making kale and chickpeas in a creamy coconut sauce. If I have cooked rice on hand, I just add it to make the meal more substantial. This looks delicious! I like to keep one-bowl meals simple with roasted vegetables, tofu and brown rice with some kind of lemon, peanut or tamari-based sauce. This tempeh looks awesome. Always looking for new ways to make one pot bowls. I was given a Instant Pot over the holidays and it has turned everything into a one-pot meal. But curries will always have a special place in my heart. This looks amazing, Gena. Thank you for giving us a preview of Power Plates. I can’t wait to get my copy :). So excited for your book!! Congratulations—I love all your recipes…you are the queen of hearty, delicious, well-balanced meals that just make you feel good, and it will be such a treat to have some of your best/favorites in one tangible location! So appreciate you and look forward to each and every one of your posts! As for my favorite one-pot meal, it’s currently lentil curry. 🙂 Also, the recipe you shared from your book looks amazing—definitely on my to-make list! Congratulations on your book! This tempeh sounds great – I’m always looking for new ways to prepare that particular protein. I’m excited to check out your book. Thank you for the chance to win a copy! I love making a huge simple pot of rice and beans. This recipe looks awesome and your new book looks so beautiful. Thank you for the chance to win! I like to make bowls just like this recipe. Lots of greens topped with a starch, protein, and roasted vegetables. I am looking forward to trying this dressing, I’m glad you list an oil-free option! My favorite one pot dish is any type of soup – lately I’ve been loving a great sweet potato/carrot combo with warm spices like ginger and cinnamon, finished with a swirl of coconut milk and lime juice. greens with some protein and loads of roasted veggies w/ a side of toasted whole grain bread w/ nut butter. It is still a one bowl meal w/ bread on the side – right? Congratulations! The book looks fabulous. Often I do roasted vegetable tray but I’ve also been enjoying your turmeric rice and greens recipe. I love my friend’s recipe for their vegan shawarma casserole! Congrats my dear!!! Honored to have been a tester for this one and loving everything we’re (re)making so far from it. Taco salad is my one dish easy go to meal! Like all your recipes, this one looks amazing! My favorite one-pot meal is savory oats! Congratulations Gena! This sounds like an excellent idea for a cookbook. I tend to make a lot of bowl meals when I’m short on time. Easy and nutrient-packed! I can’t access the giveaway! A screen keeps coming up saying that it’s a rafflecopter giveaway but it doesn’t do anything after that. I made the tempeh and dressing, by the way, and it was fantastic, so I’d like to enter to win the book. I’m so glad you enjoyed the tempeh and dressing but sorry about the Rafflecopter widget! You need to sign in with either FB or an email—were you able to get that far through the blog? Will definitely give this recipe a try and look forward to get your book soon! Thanks a lot for great recipes!!! Congratulations! I’m so excited to try this–especially that tempeh!! Soups and salads are great one pot/one dish meals. love your blog. can’t wait to see the book. wishing you only the best this year. My fave one-bowl meal would have brown rice, lentils and probably broccoli! Sooooooo happy you’ve brought this book into the world – many congratulations!! So excited for you! Beautiful photography as always. I’m depending on stock pots full of cauliflower rice with fennel, dukkah, saffron, and olives to get me through the term -convenient ingredients all sourced from Trader Joe’s. How exciting to see it finally released! I can’t wait to try out the cider variation in this tempeh! love the idea behind the book, i’m always looking for more inspiration on creating nutritionally balanced meals. One of my favourite one-pot meals is edamame, tofu and any type of grain. I add lots of veg to the pot and finish off with drizzle of oil or sprinkle of sesame seeds. So happy for you, Gena, congratulations! I know you worked so hard on this book and had so much other stuff going on during the process and I’m sure the end result is amazing. I love soups! Give me a cozy one-pot soup any day of the week and I’m happy. I know I’m getting a copy of the book anyway but if I win I have lots of friends back home who would be thrilled to receive a copy! One pot pasta! This looks amazing Gena congrats on the new book! So excited for your book! I love a good burrito bowl. Can’t wait to try some of the bowls from your book. I love making alphabet soup. Easy to make, and I haven’t met anyone who didn’t like my alphabet soup. Lentil pasta with tomato sauce and vegan parm! So excited for this book! Choosing Raw has a ton of my all time favorite recipes, and this one looks incredible too! This book looks fabulous! 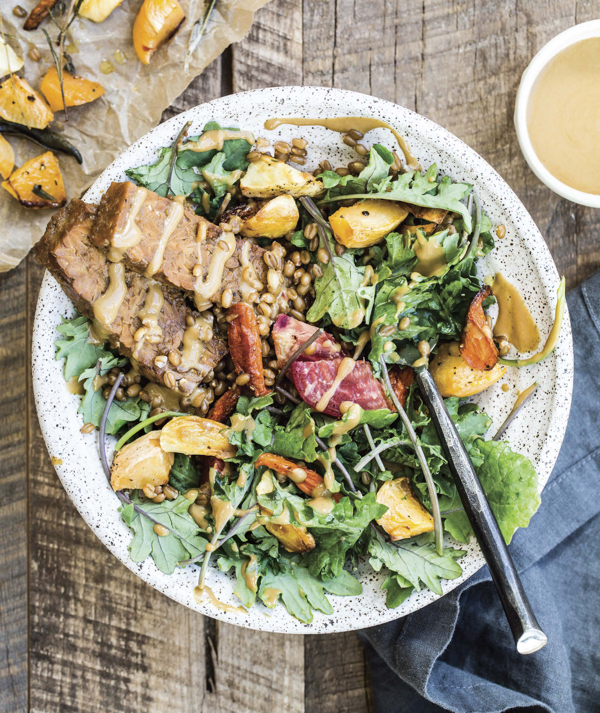 I love a good bowl filled with different colours and textures – grains, roasted veggies, legumes, a bit of crunch from nuts or seeds and an amazing dressing to tie it all together. I love a hearty bowl of soup, nothing beats that on a cold michigan winter day. I also love hearty salad bowls, with grains, beans, and roasted root veggies. These recipes look delicious! My favorite one pot meal is chili. Would love a guide to incorporate some vegan dishes in to my repertoire. I’m trying to branch out from a restrictive paleo-esque diet and try some new things. Congratulations 🙂 Love your blog, as well as your Food 52 Vegan Cookbook. Can’t wait to check this new one out. My favorite one-pot meal is anything with a combo of a hearty grain, some legumes, and a green…add spices or a yummy sauce…can’t go wrong in my book! I made a red lentil curry that has quickly become a household favorite. I love the concept of this cookbook! “Cheesy” pureed broccoli soup. I mix up the veggies each time too. I make a stir fry with lots of veggies and some tofu that’s become my favorite one dish meal. Congratulations on publishing the cookbook, Gena! I hope you find time to celebrate amidst your studies and blogging. I’m in graduate school right now and don’t have a dishwasher in my tiny apartment, so I make many one-dish meals to conserve time and energy. A recurring favorite is a recipe for lentils, greens, and rice that Melissa Clark published in the NY Times a few years ago. Depending on the season I have enjoyed making your Spring Lemon Orzo Pasta Salad and the Spicy Black Bean Soup with Kale. I happened to have tempeh on hand last night and, following your suggestion, served it with a different salad–it was delicious and elegantly simple! Thank you for sharing your candid, thoughtful writing about food with us. I can’t wait to get a copy of your Cookbook. I love the Ashley’s photo. You are both so talented. 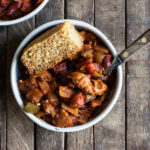 My favorite one pot meal is any bean stew. Currently, my favorite 1 pot dish is the root veg dal in Laura’s cookbook, the first mess. I have made it 3 times, each time with a different veg! Chili’s and stews are my favorite (even in summer time lol). They are always super comforting but easily made to be super healthy at the same time. They can be thrown in the slow cooker or pressure cooker really easily. Add some rice or sourdough and what could be better? And my favourite one-dish meal would be a giant bowl of roasted veggies or salad with a homemade creamy dressing, nuts, seeds, and fruit – I love to combine lots of different ingredients from my pantry and fridge! My favorite one pot meal is Sweet Potato Hash.